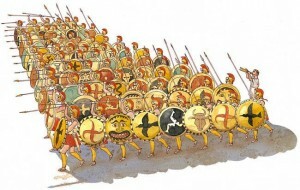 What a typical hoplite phalanx looked like. There were 2 common formations of the Phalanx. 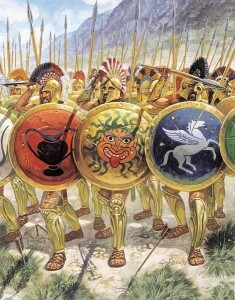 The most common was the “close-order” phalanx. 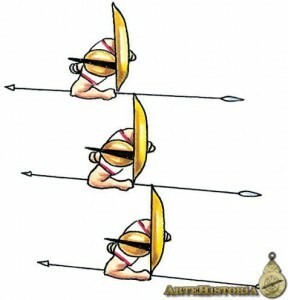 In this formation, hoplites stood 45 cm apart (around 1.5 feet), with their shields overlapping. This created an interlocked shield wall that made the phalanx nearly impenetrable. Movement in this type of formation would have been extremely difficult to keep the spacing correct (see Mathew 2009, 406) . The other type of formation was the “immediate order” phalanx. Hoplites stood 90 cm (around 3 feet) away from each other. This let just the rims of their shields to touch since the shields had a 90 cm diameter. This formation was typically used for movement (see Mathew 2009, 408). 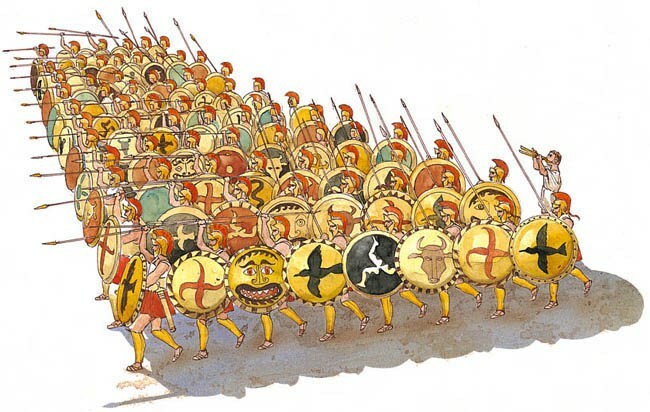 Hoplites in an “immediate-order” phalanx. Like the military today, hoplite armies were broken down from large groups to individual ranks and files. A battalion of 100 hoplites (lochos) was separated into 2 companies (penekostyes), then split even further down to 2 platoons (enomotiai). The platoon leader (enomotarch) was normally in the front right corner of a platoon formation (see Ferrill 1985, 105). Each hoplite was assigned a rank (horizontal row) and a file (vertical column), although each hoplite identified themselves according to their file (see Ferrill 1985, 102). The success of the phalanx was due to the teamwork and camaraderie of the hoplites involved in it.